Your wheels play a big role in the performance of your car. A good set of C7 Corvette wheels will impress people before and after you step on the gas. 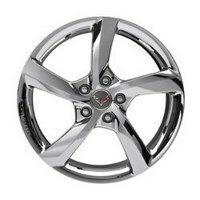 Corvette Mods has a wide assortment of 2014-2019 Corvette wheels that will please C7 owners looking for easy, one-stop shopping. We have free shipping for all orders over $199 and competitive prices on both OEM-style Corvette wheels and custom Stingray Corvette accessories. We have all kinds of 2014 Corvette wheels for sale and we even handle Corvette C7 tires. There are five primary choices for wheels: C7 Corvette Stingray 2014+ GM Five-Spoke Silver Wheels; C7 Corvette Stingray 2014+ Five-Spoke Chrome Wheels; C7 Corvette Stingray+ GT2 Wheels; C7 Corvette Stingray 2014+ GM Z51 Style Wheels; and last but certainly not least, C7 Corvette Stingray 2014+ Forged SR1 Custom Wheels in Black/Chrome. All these are great choices for replacing dinged or damaged wheels or giving your ride that customized, one-of-a-kind look that will turn heads even a few degrees farther. There are cast aluminum Corvette wheels, forged wheels, and others that bolt on with no mods needed. 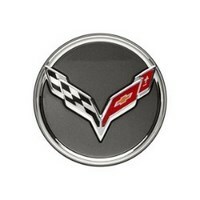 Corvette Mods also offers a full line of wheel accessories, including C7 Corvette Stingray 2014+ GM Center Caps with four different designs: Crossed Flags, Jake, Stingray or Z51. Locking lug nuts, wheel spacers, tire pressure sensors, and valve stem caps are other important Corvette parts to own. If you want to add a little extra flair, order wheel insert decals or tire stickers that announce who and what you trust on the road. The Mod Rewards program will help frequent shoppers with points towards your next custom upgrade.